This website is part of a collaborative study done by researchers at the University of New Mexico and at Citizen Lab, Munk School of Global Affairs, University of Toronto. We present over a year and a half of data from tracking the censorship and surveillance keyword lists of two instant messaging programs used in China. Through reverse engineering of TOM-Skype and Sina UC, we were able to obtain the URLs and encryption keys for various versions of these two programs and have been downloading the keyword blacklists every day. Visualizations of this data and how changes in the lists correlate with contextual information such as current events are presented here. 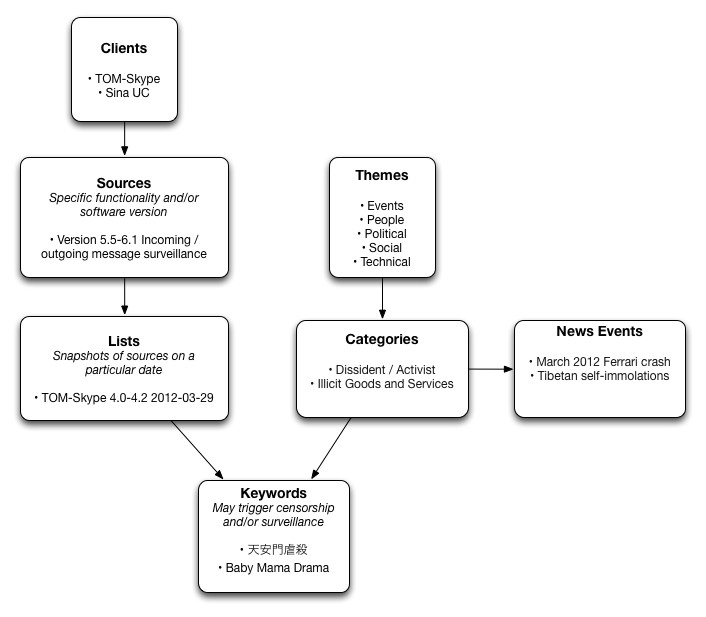 The two clients, TOM-Skype and Sina UC, are associated with sources, which correspond to certain versions of a client or specific functionality within them. Each source comprises one or more lists, which represent the snapshot of a source on a particular date. Each list is in turn made up of keywords. Sometimes keywords appear on the same list more than once. The keywords have been human translated and placed into categories. In some cases a word may be in more than one category. Categories themselves are grouped into six themes: events, people, political, social, technology, and miscellaneous. The political category is also further broken down into more specific subcategories.